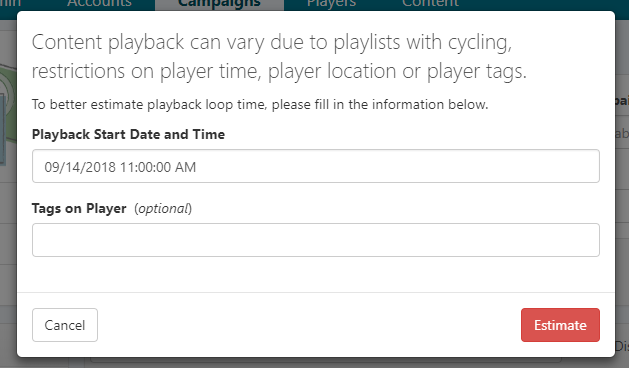 Obtain a precise estimative of playlist duration taking into account content restrictions. Deploying playlists is a great strategy to keep strict control of content playback on your signage network. On a single page you are able to have an overview of signage playback, and target content based on time, day of the week and player tags. Create a playlist or choose an existing one. Click on "Estimate playlist duration" button below playlist basic info. In the pop-up window OnSign TV will ask you for when you want to get the estimative for. By default, OnSign TV will fill it with current time, but you can choose any day and time. For instance, below we first selected Saturday 11AM. As you might have noticed, the playlist duration is shorter on Thursday than on Saturday. This might be due to campaign playback resctriction, as some campaigns are set to be displayed only on weekends. 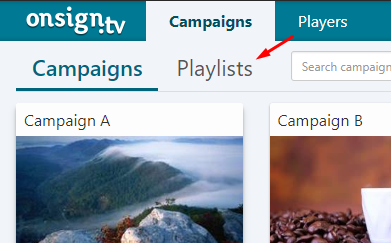 These restrictions are visible through the clock icon displayed on campaign thumbnail corner (see "Campaign A" on image above).